Exercise has been touted as the fountain of youth by doctors and fitness writers for the past decade. The problem with most of us is finding the time, money, energy and correct routine. Top this off with nagging injuries that sideline us just as we start making progress. Enter my Forever Young Routine that solves these problems. #1 Time – 15 minutes 3 times a week for a total of 45 minutes a week. #2 Money – Bodyweight exercises that require the most basic equipment. You will need a chin-up bar and your floor. #3 Energy – 5 of your 15 minute workout is rigorous with 10 minutes on stretching and rehab moves. #4 Correct Routine – The absolute BEST exercises require you to move your body through space using a multi-joint compound movement. There are only 5 or 6 such exercises! Chin-ups, dips, push-ups, squats, dead lifts, and the clean & jerk. Note: I do not recommend the last 3 because of the propensity for injury. #5 Abs for health – A must for sustained physical fitness and health are rock hard abs. The following routine has one muscle building movement, one muscle stretching movement and one rehab movement. Repeat 10 to 12 times in 15 minutes. Note the stretching and the rehab exercises provide a rest for the chin-ups. Exercises are non-stop. Pushups – 4-10 reps – substitute parallel bar dips if push-ups are too easy. 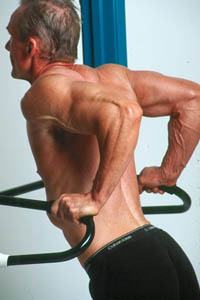 Light shrugs with shoulders pulled back at top of shrugs. Again light dumbbells or small water filled containers with handles. Exercises are non-stop. Complete the above 3 for 10 to 12 times in 15 minutes. Frog Jumps 8-12 reps. (To do a frog jump, squat down onto your haunches then spring up jumping as high as possible. Make sure you have head clearance. Immediately go back down to your haunches then jump again. These are very difficult and your legs will feel like rubber after a couple. Repeat 10 to 12 times in a non-stop fashion. If you do not complete 10 sets in 15 minutes you are still finished. Why does this routine work? The #1 exercise per workout sessions is the best for recruiting the maximum amount of total body muscle. The #2 exercise stretches these muscles for additional muscle fiber requirement (muscles stretched just prior to contracting have a higher muscle recruitment rate) Gently stretched muscles are less likely to incur injury. The #3 exercise is any rehab exercise your chiropractor, physiotherapist or coach has recommended you do but since your injury is not bothering you today to have neglected these. After living for over ½ a century my list of injuries include bursitis in both shoulders, levator scapula tear and ruptured disks in my lower back. Lifting heavy weights and careless work habits are all sins of my youth that I must deal with now. You can use my rehab exercises or better yet substitute your own. Lats – Bend over at the waist and reach one arm to a door knob or other fixed object you can grab. Now that your in this position, keep your elbow up and twist your hips away from the fixed arm. You will feel a mild stretch from your arm pit down along your side. Hold for 20 seconds or so and repeat for the other side. Pectorals – Lay on your back on a bench or floor. With a couple of small dumbbells or cans of soup spread your arms as wide as you can and horizontal to the floor. You should feel a mild stretch in your chest. Hold for 20 seconds or so. Lower back – stand with feet shoulder width and hands on hips leaning back as far as comfortable. Hold for a count of two. The above routine 3 times a week is an easy minimum for anyone’s schedule and fitness level. Once you can easily do 10-12 reps of chin-ups, dips or push-ups per set with 10-12 sets you are ready to double up this routine. Same routine except you do it 2 times a week. The same routine day 1, 2, 3 then repeat day 4, 5, 6 with day 7 as a day off. If you can do this routine everyday for 6 days at only 15 minutes a day then you can rack up some impressive numbers. For instance you will have 200 chin-ups and 200 push-ups per week. This is an awesome volume of two strength and muscle builders.